Easy-to-use multi-touch screen, TotalScan™ transducer, and support for radar so you can fish like a pro! The GO9 XSE chartplotter navigation display is a great way to expand the capabilities of sportboats, cruisers, and smaller center consoles with plug-and-play support for Simrad Broadband Radar™ and Halo™ Pulse Compression radar systems. 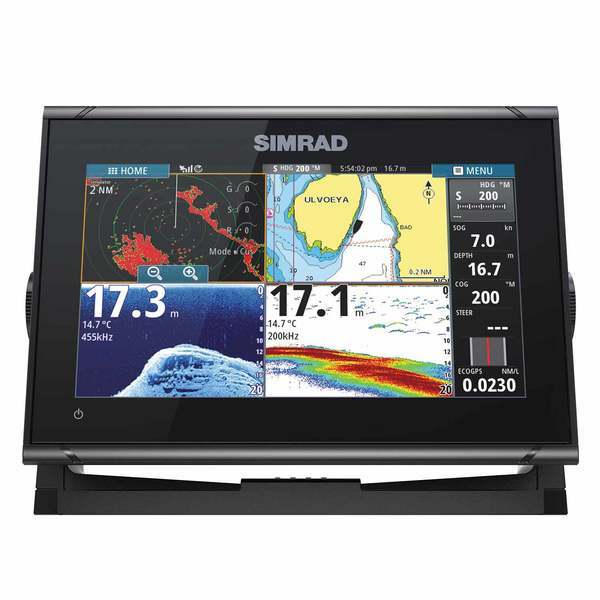 Behind a super-bright, multi-touch widescreen display lies a built-in GPS receiver, GoFree® Wi-Fi, and industry standard NMEA 2000 connectivity. Connect with smartphones and tablets, control your onboard sound system, monitor engine data, and choose from an array of built-in sonar technology to cruise with confidence and find fish like a pro. A massive leap forward in fish-finding technology, FishReveal makes it easier to see fish on DownScan Imaging™. Unlike traditional CHIRP views that provide strong fish targets, but lack refined structure detail, or DownScan Imaging that provides photo-like images of the bottom and structure details but shows fish targets as tiny dots—FishReveal Smart Target Viewing blends the best data from both, eliminating the need for split-screen viewing and interpretation. What is Pulse Compression or Broadband radar?